Almost nothing is known of Bartolomeo Veneto’s training except that he worked in Lombardy and in the Veneto. His life, of which again little is known, has been reconstructed through his work and the inscriptions on his paintings. One of his religious compositions, for example, is signed with the interesting epigraph: “Bartolomeo half-Venetian, half-Cremonese”, suggesting that he may have been Cremonese by origin. The artist was in Ferrara between 1505 and 1508. He probably visited Padua in 1512 and is documented in Milan from 1520. 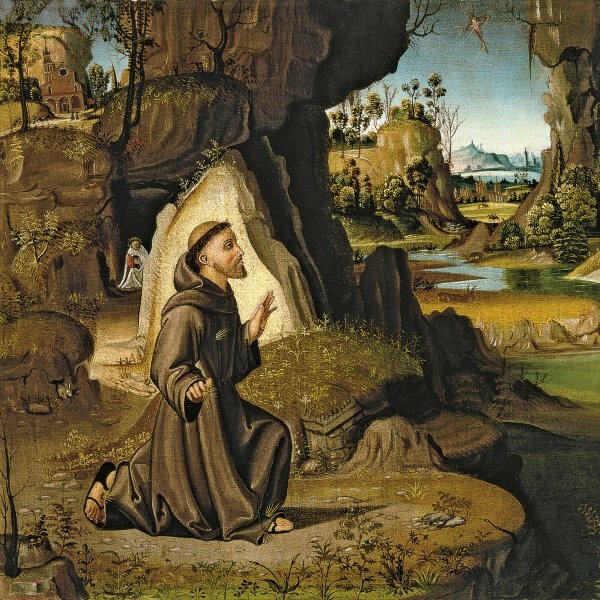 His output includes religious paintings, particularly depictions of the Virgin and Child, such as the one in the Accademia in Bergamo, which suggests the influence of the Bellini workshop. This influence is also evident in the early group of works attributed to him and which includes subjects painted by the Bellini, such as The Circumcision (Musée du Louvre, Paris). Bartolomeo Veneto, is, however, most noted for his portraits, the genre in which he was most active throughout his career. These highly realistic images often have heavy velvet curtains as backgrounds, falling in numerous folds but on occasions leaving a space through which the viewer can see a landscape. The present Portrait of a Man was attributed to Veneto by Venturi, who considered it a late work in his career. This attribution was maintained by other art historians including Berenson, Hendy and Heinemann, who all dated it to around 1525–30, while D’Achiardi placed it around 1520. In her monograph on the artist Laura Pagnotta retained the date of around 1530 but considered the attribution to be uncertain. The painting was included in two exhibitions in Germany: one held in Munich in 1901 and the other in Düsseldorf in 1929. The artist depicts a figure outlined against a blue background with white horizontal lines, probably representing an area of sky. This standing figure is notable for his costly clothing with its wealth of details and for the gesture of his hands and the colouring, in which a limited range of colours conveys a wealth of nuances in the clothing. The panel has various elements characteristic of this artist’s portraiture such as the care in the depiction of the clothes, the delicacy and refinement in the depiction of the details and accessories, the realism of the face and the graphic line evident in important elements such as the hands. 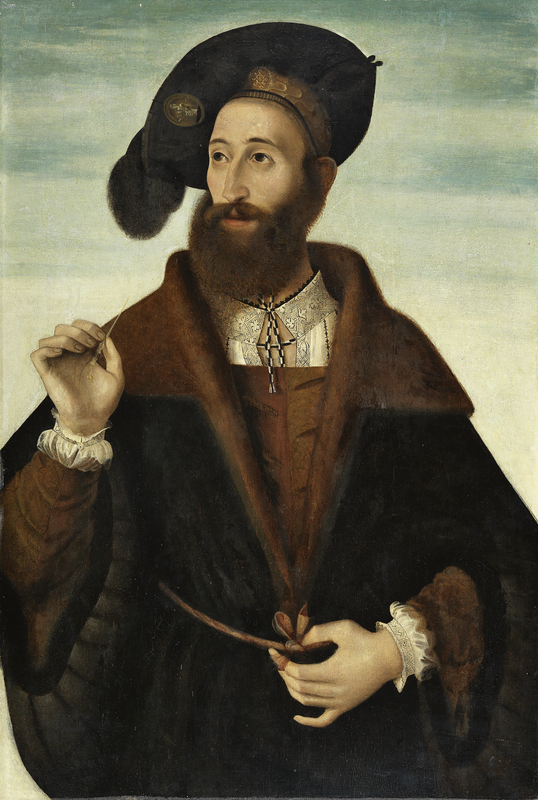 In this case the distinguished sitter delicately holds a fine gold toothpick while the fingers of his other hand rest on his narrow belt that closes his ample coat. The colour range used to depict this refined individual is based on chestnut brown tones, dark in the case of his coat and hat and light in the case of his fur collar and the curly beard that covers his face. This tonality extends to the sleeves and other details of the clothing and contributes to an overall sense of unity. The painting was formerly in the collection of Baron Heinrich von Tucher.